In the last week, the Vanguard asked the school board candidates to respond to a question on whether they believe there is an achievement gap and what concrete steps there are to address the achievement gap. To their credit, the six candidates who answered the question and the two candidates who provided expanded remarks understood that there was an achievement gap and provided some ideas on how to address it. I think the answers overall were good and constructive, focusing on things like early learning for children at risk, programs for English learners, an understanding of the large number of students who are Title I (eligible for free and reduced lunch), preschool and transitional kindergarten, and much more. I do not want to put down these responses, because they are good responses, but at the same time, I don’t think they get to the heart of the problem. On December 1, 2012, the Davis Human Relations Commission hosted an event called “Breaking the Silence of Racism.” About 200 community members attended and roughly 60 spoke – so many that we actually extended the event by a full hour to accommodate all who wished to make their voices heard. We had a panel comprised of Davis City Councilmember Rochelle Swanson, Chief Deputy DA Jonathan Raven, Reverend Kristin Stoneking of the Cal Aggie Christian Association, UC Davis Executive Vice Chancellor Rahim Reed, Pam Mari from DJUSD and Captain Darren Pytel of the Davis Police Department. The bulk of the event was about the racial climate that the average citizen in the city faces, and it was about the schools. Parents and even teachers poured out their hearts, often to the point of tears. While I cannot speak for the initial commenter, I will respond by stating that this is exactly what the anecdotal information available leads me to believe – that Davis, a largely progressive but also white and affluent town does not have a good record of treating people of color as well as we might want to believe. In fact, that exact point was made by a local business person who came to the Davis Human Relations Commission event in December 2012. While this man was white, he spoke passionately about the experiences that his African-American grandchildren had while living in Davis. Another parent raised three African-American sons, and worried that there are not enough people, looking like her sons, teaching them in the classroom. She added that she wants to see school climate committees separated from school site councils. She said the two are tied together and the site council has primarily dealt with budget issues rather than climate issues. What was interesting about these speakers is I believe all but one were white. However, they had interracial families and therefore they were able to describe the conditions of the schools, as being unaccepting to both minorities and mixed-race children, from a different perspective than we generally hear. Pam Mari, who has since retired, was on the hot seat the most during this three hours of public comment. She noted at the time – regretfully – that the school district has for the last several years simply been in survival mode. But she felt that was not a good excuse. I really do not believe there has been a lot done in the schools in the nearly two years since this event to change things. When we talk about the achievement gap, we can talk about educational programs all we want, but I think until we deal with the social, cultural, and racial climate at these schools, we are talking into the wind when we talk merely about programs. Davis has, according to all reports and studies that I have seen, one of the largest achievement gaps in the region and one of the reasons for that is the disconnectedness of racial minorities and mixed-race kids. This is what was not addressed by the candidates or the district in the last two years, and I think this is the key. Thank you for writing this. Reading the candidate statements, it felt like the elephant in the room. Thanks for pointing out the elephant. i commented on that yesterday and i see you followed up as well. Yes, thanks also to you for raising the issue. Your comments there were spot on. Another elephant in the room. Asian racism towards African American and Hispanic students. The split, in fourth grade where the majority of Asian students enter the AIM program and the majority of the Hispanic students don’t. They don’t interact again and they are not taught, or expected–either grouping–to appreciate each other, let alone tolerate each other. It is racist to not expect everyone to strive for the same social standards. Racism is hard-wired into the system, when you segregate students into different parts of campus so they can attend their different programs. How do you know it is not the African American or Hispanic kids that are the ones choosing not to interact with the Asian kids. I think the more important point is not who chooses to interact or not. Rather it is that the two groups do not have good relations. MrsW: The split, in fourth grade where the majority of Asian students enter the AIM program and the majority of the Hispanic students don’t. I can’t personally identify Asian racism mentioned here, but in an earlier article right after the candidates forum, I took issue with how the district doesn’t appear to make information fully available to Spanish speaking parents (who don’t speak English very well), here, using AIM as an example. It seems that there is a very good representative population districtwide among various demographic subgroups, but when it comes to actual participation, then typical differences appear, for instance, Latino students don’t participate in AIM at the same rates as others. I have asserted that one issue is that information about AIM isn’t adequately communicated to Spanish-speaking parents. Why have your child participate in a program that you don’t understand what it is? What about other barriers, like being a late bloomer and the what is essentially pay-to-play in high school music program? As you’ve pointed out before, foreign language and music are liked to achievement, but if a student is participating in the AVID program, they have to choose between foreign language or music. How many AVID students choose music? I don’t disagree with you that there are other barriers to participation. Other examples are that ELL students may also have an elective in secondary grades taken up by ELL instruction. I think AVID and ELL instruction are well-meaning, but (IMO) tend to create a limiting effect on opportunities for curricular breadth. I don’t know how many AVID students do or don’t choose music. It’s an interesting question. But if a student is counseled to take AVID rather than music, then he/she can lose the opportunity to find out if that activity allowed him/her to shine, be engaged and connected in ways that weren’t otherwise possible. Characterizing the high school music program as “pay-to-play” may in part reflect the high expectations of parents and students. I take it that you mean the higher incidence of students taking private lessons in order to succeed in auditioning for audition music groups. It certainly helps to have private lessons, but I have seen several students succeed without private lessons. They were typically highly self-motivated, or auditioned on instruments/parts that weren’t as competitive. Having high expectations is good, but may miss the opportunity for achieving balance if pursued with excessive zeal. I have seen high school students coming with an all-or-nothing approach to auditioning for music. If they don’t get into the audition group, then they’re not going to sign up for the non-audition group. What they lose is the chance to be a leader in the non-audition group as opposed being likely a follower in an audition group. Leadership opportunities come in ways that one might not expect. According to the DHS catalog, only 1 out of 10 (total) performance music courses is non-audition. There is also a music theory course that does not have prerequisites or is not honors. There are actually 3 performance music class that are non-audition: Concert Band, Chamber Orchestra, and Concert Choir. If you refer to prerequisite requirements, then only Concert Choir as a music performance group has no prerequisite. I don’t dispute the fundraising that’s required; the district won’t provide it. The fundraising is supposed to be conducted in such a way so that a student isn’t penalized for not providing funds. I don’t dispute that it isn’t perfect. That’s what you get when music remains only an elective in the schools as opposed to a compulsory subject. It’s a similar phenomenon found in “choice” programs throughout various school systems, certain kinds of self-segregation that provoke questions. I just saw this relevant article posted online at the Enterprise. “Rich” here refers to families earning $253,146/year or more, by the way. What that means, practically, is that a student has been playing more or less regularly since the elementary program. If a person comes into the non-audition group that requires that pre-requisite, without having been in the JH program, the music director will ask student to demonstrate that he/she can play at a minimum level to participate. But there isn’t any cap or limit to the number of students who can sign up for a non-audition group. Again, I don’t dispute that this is an imperfect system. But I don’t think that means to tear it down. I have seen the district music program do great things for students who weren’t thriving in conventional academic ways, including providing positive outcomes for students who were Latino, ELL, low-SES, and also for otherwise under-achieving white students. One solution is to make music compulsory at a certain level. If everyone is required to take music, that puts more burden on the district to truly provide instruments for everyone, and to make sure that there aren’t these kinds of barriers. I am very disappointed that this discussion (access to “elective” programs such as music, AIM, athletics, Montessori, Da Vinci, Spanish Immersion) hasn’t been addressed in more detail in the school board race. Several candidates speak in more general terms, such as “I support seeing every child succeed.” While that’s commendable, not addressing specific challenges that exist with making each program more accessible conveys a certain blindness to the issues that exist. Candidates being able to identify specifically why certain programs aren’t more accessible informs me that those candidates might be able to present a solution. Barbara Archer was about as specific as any candidate in the forum when she described improving accessibility in the music program through language services (translated documents and having interpretors available). How about black towards white racism in schools? Or black vs Latino and Latino vs black violence? I attended a number of school climate committee meetings over two years and essentially heard that 1) they are funded, so they are performed; and 2) the administration was “empowering” student leadership to address the school climate, i.e. abdicating all adult responsibility for school climate. I think this is all a bunch of BS. My sons both had groups of friends that looked like the UN. They all go along and still get along. They tease each other about any and all things. Once when we were driving back from a tip with my son and one of his friends of color, I asked him if he experienced any racism in school or town. It didn’t take long for me to realize that I made a mistake asking the question. His friend said that he had not really thought about it until just that moment. It was a completely innocent and heartfelt response. Adults that cannot stop seeing the world through race-tinted glasses are the remaining significant source of racism in this community and this country. Please get your nose out of the business of these kids and go find some other cause. Left along they will get along fine. It is the bias of the adults that enflames problems and prevents our progress to a civil rights version 2.0 achievement. so we should ignore the countless examples in the community, the various testimony given at this event, and take the word of a single-source, the hearsay evidence given by a man who has vehemently argued time and time again against the possibility of racism in this community? My experiences parallel yours. There are subtle cultural differences, and the kids have fun with that. But this article seems a bit like spaghetti to me, hard to nail down. Frankly, the exception does not make the rule, nor does it overturn the rule. The fact that you and I and Tia all get along despite our very clear differences is a testament to the fact that you are a lot more open-minded than your rhetoric here in the Vanguard would lead people to believe. I am sure that that open-mindedness (on some issues) was a real benefit to your sons as they grew up. Unfortunately that is not the environment that all sons (and daughters) grow up in. The exception is material harm from racial discrimination or racial bias. The rule is the teasing that kids do, and the tribalism that humans cannot overcome. If you want a more integrated and equal-achievement world, you would demand that we start talking the walk. Do you know the science on this? When people start behaving in a way that meets their expectations, their expectations generally are met. If you keep telling the kids that there are so many victims of racial bias, then there will be victims of racial bias. You create the problem by repeating yourself. Great point, but I don’t think they will want to hear it. Like AG Eric Holder saying we are “cowards” regarding discussing race… no, the cowards are those on the left that want to limit discussion. We talk about race and racism endlessly, yet we just find out there is a mammoth truancy problem in Oakland regarding attendance for black children? President Bill Clinton paneled a group on race, and guess what… he had one quasi conservative, so he loaded the panel with people who would give him the answer he wanted. There was no dialog there. Case in point per Frankly: over 2 decades ago liberal leaders in San Francisco saw that Chinese parents started Saturday School on their own, and black leaders complained that this was not “fair”. So the SFUSD started their own Saturday School program, aimed specifically to meet the needs of black families and liberal complainers. Guess who showed up? Asian-American students were over represented, and African-American students were under represented. I do not believe that humans cannot overcome tribalism. I believe that this is a choice. We have the ability to overcome our biases given the will. It is the will that is lacking, not the ability. Its my view that tribalism is innate and cannot be uprooted; there is a deep need for tribal belonging (next layer outside family belonging). What is quite flexible, however, is the definition of who belongs to the tribe. The tribal belonging is mainly cultural and not racial–there is ample historical evidence that all races and tribes have adopted members of different races/tribes, and they were accepted as full members of the new tribe when they adopted the culture of the new tribe. It was probably an honest response from your teenage son. I’ve been through enough workshops and training sessions to understand that racism is often unconscious – unconscious bias toward/against others. It is not until one has a opportunity to honestly examine one’s beliefs and actions that it be comes apparent. This is BS too… and the Hoy Grail of the race-baiters and left politicos that envision a monopoly on political power by keeping enflaming race relations. Once ya’ll agree that you are just racists because you are not black or brown, then you have lost your mind, your soul and your freedom. The dream of every social justice crusader is to eliminate obvious behavior and fact from consideration, and train the collective to just accept their BS. I suggest that anyone that cares shout down people spouting this BS at avery sound bite. The only thing “unconscious” is the brains of those spouting the BS and those that lap it up. Frankly: I suggest that anyone that cares shout down people spouting this BS at avery sound bite. The only thing “unconscious” is the brains of those spouting the BS and those that lap it up. Maybe you should show up to make your feelings known the next time there’s a “Breaking the Silence of Racism” event. That would be as effective as me taking away crack from a crack addict. The point isn’t that racism does not exist, the point is that it does not exist enough to justify the continued existence of the racism industry, and the continued lie that it does cause more harm than good. Just focus on reducing bullying and promoting equality of opportunity for all and we will move the needle to the next phase of civil rights. Otherwise we are stuck in a closed loop circle where we create victims that would otherwise not exist. My youngest son was teased because he was short. My oldest because he was sensitive. I got teased because I had a Midwest accent, long hair and acne. A popular black or Latino boy or girl is not going to face any more bias that is any other popular kid. But nerdy, antisocial and shy kids will get picked on no matter what race. And when they do and they have darker skin, you and others step forward to claim that it is racism… and the child then is damaged in understanding the truth, and adults are misdirected from working on the real solutions. I bet you enjoy Dr. Thomas Sowell and Dr. Walter Williams as much as I do. Yes. Dr. Ben Carson had a slight bump or two in the road because he is black, but he went on to become a world-acclaimed neonatal surgeon who pioneered 2 or 3 amazing surgeries. Could he have accomplished that in any other country, born to an illiterate Mother and living in dire poverty? But she was cagey, didn’t play the victim, and had him read like the rich children who’s families she worked for. She saw the children of wealthy families constantly reading, so she required her son’s to do book reports even though she was illiterate! It is a wonderful story. Frankly: Here’s an article I just ran across on unconscious bias training being done at Google. I really liked the embedded video. But you probably have this all figured out. What makes anyone think bullying is exclusive to race or ethnicity? Bullying is rampant if the student is a “geek”, if the student is female, if the student is a slow learner or dyslexic, and so on. My children are “white”, and all were bullied for one reason or another in Davis schools, and I’m not talking minor “kids stuff”. My daughter had a stick forced between her legs by a boy in junior high; my son was repeatedly beaten up in elementary school and again in high school. All of this went on in Davis schools. Teachers often stood by and did nothing. It wasn’t until I threatened to sue DJUSD (and I meant it) that something was finally done in regard to my son while he was in elementary school. The principle of the school suddenly took a “sabbatical” after my lawsuit threat to the Superintendent of Schools. Later my son dealt with a gang problem at DHS, that nearly got him killed (not an exaggeration). Eventually the gang perpetrators went to jail, but not before they beat up a college student within an inch of his life. There are very real school climate problems for students in the Davis schools, but not just exclusive to kids of color or certain ethnicities. Until our local schools start grappling with this issue, nothing will change. My kids were so glad to get out of Davis public schools and move on to college. They all received college degrees from UCD in spite of their bad experiences in K-12, but it left its scars. I don’t think anyone believes that it is. the issue here is the achievement gap however and how these experiences may or may not contribute to it. bullying is a problem, but the state has given the district a huge tool in ab 9 to deal with bullying. when those programs are fully funded and implemented, i would expect them to help. And you don’t think bullying keeps white kids from learning too, especially if they have a learning disability or some other “blemish”? Anon: My children are “white”, and all were bullied for one reason or another in Davis schools, and I’m not talking minor “kids stuff”. You don’t believe severe bullying still goes on in the Davis schools? Talk to parents, and I have no doubt you will get an ugly picture. I thank you not to patronize me about assumptions about what I believe. You lose credibility when you do so. I asked you when your experiences occurred. Anon, I believe you, and I believe that wdf believes you also, he just wants to know how recently this happened. Can you tell us what gang / gangs were terrorizing your sons? I am genuinely sorry to hear that your children had such bad experiences in the Davis schools. And I agree that bullying can be based on any number of different factors. But one thing that you and Frankly are missing in your analysis is that many times bullying is based on some characteristic that the child is able to change. A shy child can be taught strategies to interact more effectively with others. A child with a bad hair cut ( yes, I was a delinquent mom in this respect) can be taken to a stylist. But a person of color, if targeted for this trait has no ability to change. They have no ability to “start over”. Perhaps there is confusion as to the source of the bullying–can’t rule out that it was racial differences, but more likely was cultural differences (often confused with racial differences), or funny-sounding accent, or disdain for their fashion choices, or any of an endless list of trifles that provide an excuse to mock or bully someone that might have nothing to do with skin color. Tia, there may be an actual effort to portray such behaviors as racism far more often than is warranted, and for precisely the reason that you allude to–by accepting the cause of such behaviors as racist, then the politicos and others whose profession relies largely on pointing out racism have a guarantee of future employment; because as you point out, one cannot change one’s race–however if such problems were portrayed as cultural, than one can fix one’s problems by modifying their cultural behavior; ergo you are not a victim, and the politicos, demagogues etc. who build careers exhorting the ever-present evils of racism will be out of work! Good points, tribeUSA. I know even college-educated people who incorrectly attribute acts which are impolite, or rude, or other as ‘racist’ when there is no solid proof of such. The reason the AIM/GATE programs as well as admission to top universities such as the UCsystem have a high percentage of Asian students is because Asian parenting styles demand this. This article very clearly explains this. I never read the logical connection here, the jump, from achievement gap to racism. Instead of speculation, innuendo, foggy logic or liberal guilt, how about if we look at some major facts? 1, A recent analysis shows a “deep racial divide” in truancy rates. According to a recent article in the San Francisco Chronicle: “That big difference between who’s in class and who isn’t helps explain much of the achievement gap between white and Asian students and their African American peers. 2. Davis has a school system and culture, like a Palo Alto or Danville, that if you don’t do well in school and focus on success, I can understand feeling uncomfortable. Not racism, comfort. 3. American children watch a lot of TV, and the negative affects are well documented; African American and poor children watch even more, up to 6 hours a day. I have tutored Davis Latino elementary students, ones who would likely fall into more than one achievement gap group (low SES, ELL students). Based on that, I didn’t see any unusual absence or truancy. Most of their parents worked when they could, so having their kids in school gave them flexibility to do so. > into more than one achievement gap group (low SES, ELL students). > Based on that, I didn’t see any unusual absence or truancy. Any idea if the Davis school district tracks attendance by race and if info for the entire achool district is on line somewhere? Given this study by Oakland, it would be my first order of business if I were a top official of the DJUSD. 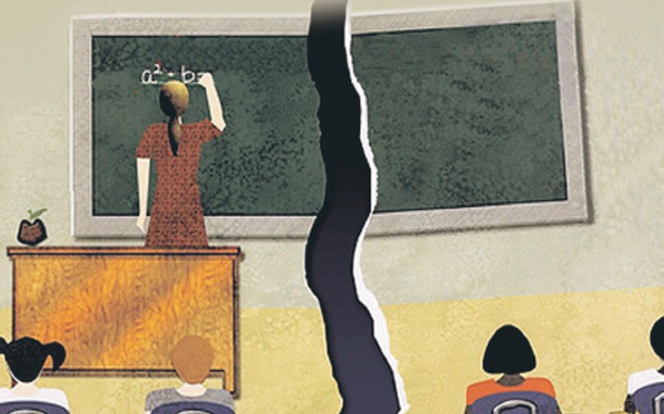 What is missing is examining how discipline is doled out – higher rates detentions, suspensions and expulsions of student of color – and other push-out policies wielded by the District. Grading policies thwart efforts to get truant students back into class and progressing toward graduation. Then there is the tracking of and separating students starting in 3rd grade that deepens the divide. Thank goodness the District can no longer suspend students for “willful defiance,” which was interpreted to include almost anything beyond the student sitting quietly at their desk and historically was directed in much greater percentages to minority students. Are these higher rates detentions, suspensions and expulsions of student of color simply based on the color of their skin, or on behavior? Example: Similar behavior – white/asian student is counseled and sent back to class, black student is suspended. You didn’t answer my question directly. Indirectly, you’re saying white liberal teachers are racist. I get it. But what if we could find a school where administrators were predominantly black, if their black students had a higher suspension rate, what would be the reason there? Behavior, right? You’re ignoring the body of research of unconscious bias which seems to me more of the factor rather than overt racism. David, can you provide a link or two to the articles about this ‘unconscious bias’ to which you refer? Thanks. Not necessarily. What if they real reason is that in their desire to help the black kids, they felt that they needed to discipline them more harshly. Kind of “spare the rod” kind of thinking. That would make it both discriminatory and racist. So what kind of retribution or corrective matter do you suggest, because we know that white students are suspended far more frequently than Asian students? How do we counter this racism? I have never heard anyone that works in the schools (publicly) say that “black and Latino boys cause more problems than white and Asian girls” so we are left to assume that the reason the only reason they have higher rates of detentions, suspensions and expulsions is that the left leaning mostly female teachers in the Davis schools have “subconscious” prejudice, and need more time off for “training” (by a group that is a big donor to the teachers union). Well, this is telling. With only 15% of the population, the Latino students are nearly matching the offenses of their white counterparts, who are 57% of the student body. That means they’re committing offenses at almost 4 times the rate of white students. Compared to Asian American students, who are 17% of the student body, Latino students commit offenses at about 10 times their rate. One of the people talked about the fact that he couldn’t get the district to address the bullying of his son, but when his son retaliated non-physically, he was suspended and then expelled. yes, would like to hear more details about this. Was the bullying physical or nonphysical? Did the non-physical retaliation include threats of physical harm? Then there was this whole other angle where they go into the bi-racial / mixed children, and this is now supposed to be a negative? I don’t know about the young years, but as they get older, children of mixed marriages often play it up and see it as an advantage. Have they become prejudiced? One tagline the young people who are mixed use on twitter is “TeamLightskinned”, and such. Within the school system, are children these days being taught and encouraged (either actively or passively) to identify themselves by their race or ethnic group? I never heard about it when I was a kid. I grew up in a mainly white town, and the minority kids (black, hispanic, asian) were all well-integrated; race was no big deal. For me the different skin color and look was just a curiosity (not good or bad); the weird thing was when I got to know a few of them personally I didn’t even notice that they had different skin color anymore. The school system had nothing to ask or say about the skin color of any of the students or about racial relations, except in history class where it was presented pretty objectively, with no self-righteous hysteria. I was at a birthday party this weekend at the home of a multi-generational Latino family, it was fun. But they didn’t wear a blindfold when it was pinata time! The kids who were between 9 and 11 never discussed race, and I used some of my minimal Spanish. In places like San Francisco ethnicity can be an obsession, but in LA there are some schools that are overwhelmingly Latino, so there is little discussion of race.